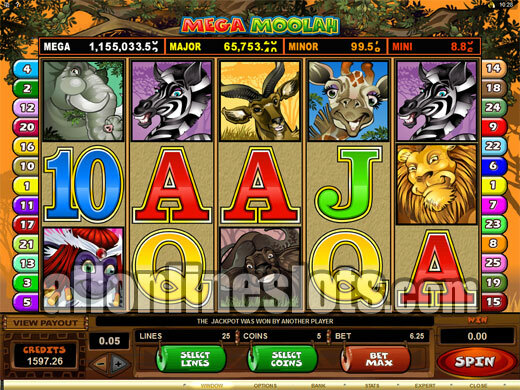 Mega Moolah is the biggest progressive slot by Microgaming. It has a base jackpot of 1,000,000 as well as three other jackpots. You can win the progressive with any bet which is quite rare. The game also has a free spins bonus with wins tripled. Microgaming have once again raised the bar in online slot entertainment with the release of their first new progressive slot machine in almost a year. 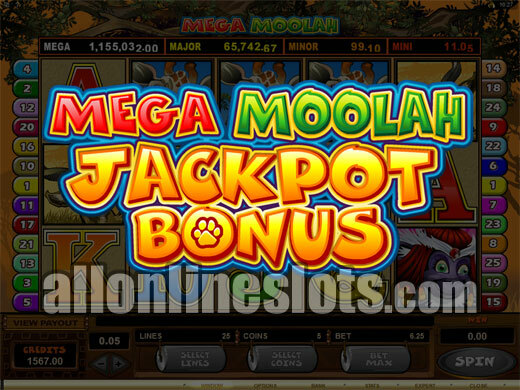 It was well worth the wait as Mega Moolah is the first online progressive to come with a base level jackpot of $1,000,000 - now whenever you log on to a Microgaming powered online casino you have a chance of winning a million. 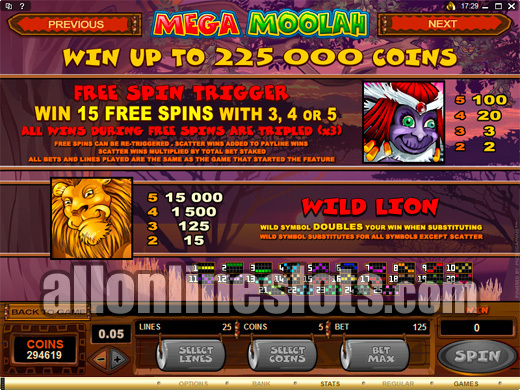 Mega Moolah actually has quite a few great features apart from the million dollar jackpot. You could say that Microgaming have taken the best parts from a range of their slot machines and combined them into one great package. Let's start with the basics and go from there. The game is a 5 reel, 25 line video slot. It comes in three different coin sizes (1¢, 2¢ and 5¢) and has a max bet of 5 coins per pay line. This means you are looking at spending 125 coins per spin. Unlike most progressives the same jackpot is available no matter which coin size you choose although there is a distinct advantage to playing the highest nickel level - more on that later. 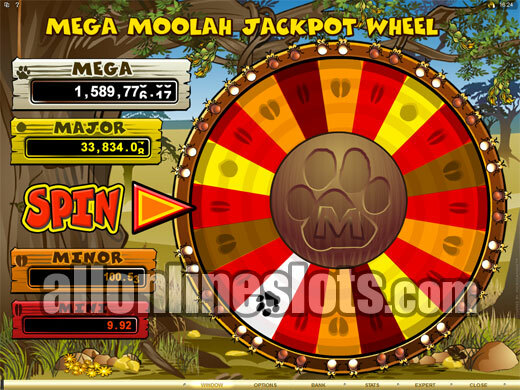 Mega Moolah has an African safari theme. Symbols include animals such as lions, giraffes, zebras and elephants as well as the common high card symbols such as jacks, queens and tens. The lion is wild for all other symbols and also doubles any win it is a part of. Highest win on the reels is 15,000 times your line bet or 75,000 coins at max bet. This is won by lining up five of the wilds. Second highest pay is 12,500 coins for five scatters. The scatter symbols also activate the free spin bonus. Hit three or more and you win 15 free games with all wins tripled. 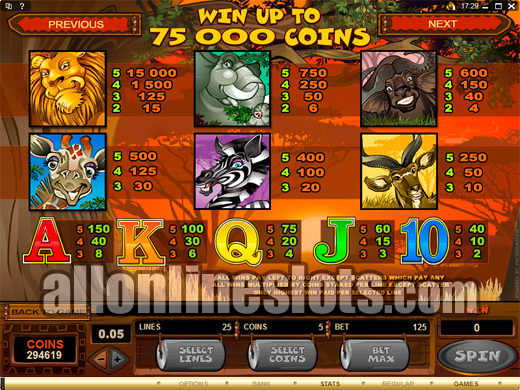 This boosts the highest jackpot up to a very handy 225,000 coins. Now to the progressive. You will notice above the reels there are four progressive meters. 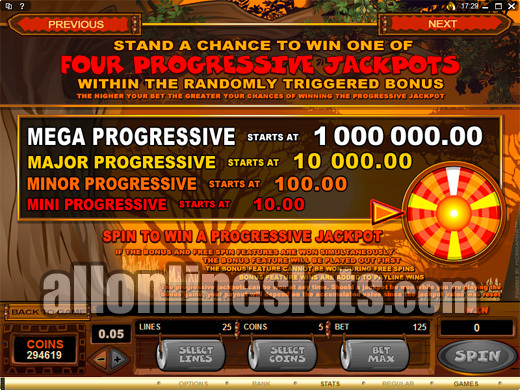 These read Mini, Minor, Major and Mega - yes, Mega Moolah has not one but four progressive jackpots. So how do you win them? At the end of every spin the jackpot bonus can be awarded randomly. You do not need to line up any specific symbols but the twist is that the jackpot will come up more often the higher you bet. So if you play at the highest coin size of a nickel you will have a better chance of activating the bonus stage than if you played the penny coin size. Having said that there is no reason why you could not win the jackpot playing pennies - it is just less likely. 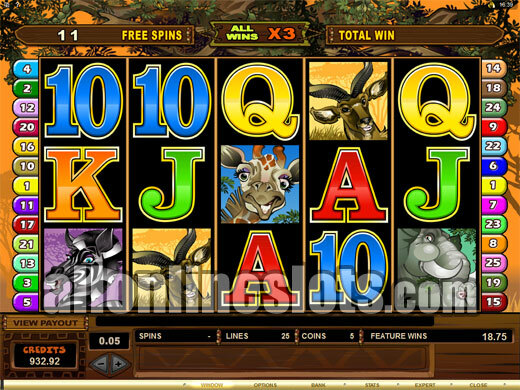 Once you have activated the jackpot bonus you are taken to the Wheel of Fortune style jackpot stage (View The Bonus). Here you simply press spin and watch the wheel spin. The segments all have one of the four possible jackpots on them. When the wheel comes to a stop you are warded the corresponding jackpot and returned to the reels. Of course the jackpots are not all of the same value. The mini starts at just $10, and the minor at $100. The Major starts at a nice $10,000 and the mega starts rolling at a big $1,000,000. The lower jackpots hit very frequently while the Mega has been won as high as $4,300,000! Overall, Microgaming has done a great job taking the best parts of their most popular games and combining them into what is sure to become one of the most popular slot machines on the Internet.